More disappointing to me was the lack of seasoning. This wasn’t something I was experimenting with. Instead, I got lazy and used rub I’d mixed up for the Super Bowl. And when I say lazy, consider that the “rub” I use for brisket is basically 50/50 salt and pepper (with a touch of garlic powder and a hint of sugar). If I had to guess, I’d say the salt sort of settled toward the bottom of the shaker so the meat wasn’t salty enough. You need a ton of salt on big cuts of meat. I also rubbed it the night before, put it in a bag and didn’t reapply anything the day of. The current setup. Yes! In New York, you even have to get your damn wood shipped. This was far from a disaster, of course. Would I have served it to people? Yes. Would they have enjoyed it? Yes. And my New York friends may have raved and said I should open a barbecue restaurant (because they secretly want to see me go bankrupt). I don’t know if I would have served it to a Texan, even though a Texan would have been polite enough to say it was fine. And Sunday’s effort was far from the days of fighting and worrying over a cheap offset and having the Fire Department called on me by neighbors. In fact, yesterday was fairly smooth sailing. The 270 Smoker is largely responsible for that. The thing is as sturdy as a tank and holds temp like nobody’s business. When I bought it, the sales guy told me I wouldn’t know what to do with myself. He was mostly right. And it cooks fast. I no longer have to deal with the Black’s method I’d been using with the offset at the old place. In fact, I’ve had to get used to things finishing faster than expected. Because the 270 holds so much, even if I’m cooking for just Cara and me, I’ll throw other things in there to experiment (or for freezing and using later). 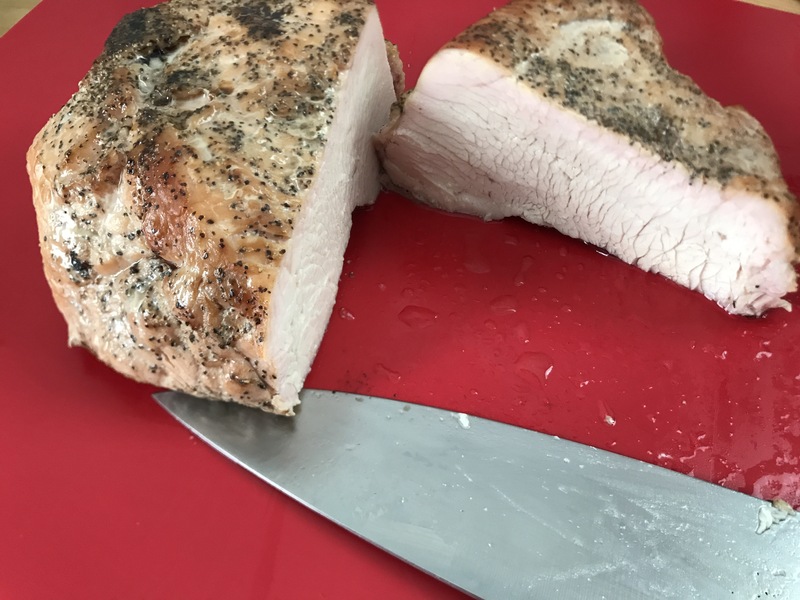 Sunday, I did a turkey breast, pork chops and beef short ribs. The turkey breast was done in about an hour as were the chops. The short ribs I left in quite a bit longer. I wanted to do giant beef short ribs, but I decided this on Thursday and didn’t have the time or inclination to track down a butcher to get dino-bones. In fact, I ordered the meat via Fresh Direct. Another lesson learned: Short of an actual butcher, Fresh Direct is a great provider for meat. Certainly better than the local Key Food for New Yorkers. Even when the local Key Food carries brisket, it’s basically the smallest, thinnest part of the flat with all the fat trimmed off of it. At best, it’s “select” grade. And they’re still going to get you for $5.99 a pound. Fresh Direct was $11.99 a pound — and this is the part where folks who still live in Texas fall on the floor laughing — but it was a much better cut of meat. They only offered flats, but it was a handsome hunk of beef. Not only did they leave fat on it, there was even a bit of point left in there. Short Rib: Could have gone a little longer, I think. So, note to self: Next time, more smoke, more salt. Previous Post Is Morning Media Making You Mopey? Nice looking chow there. 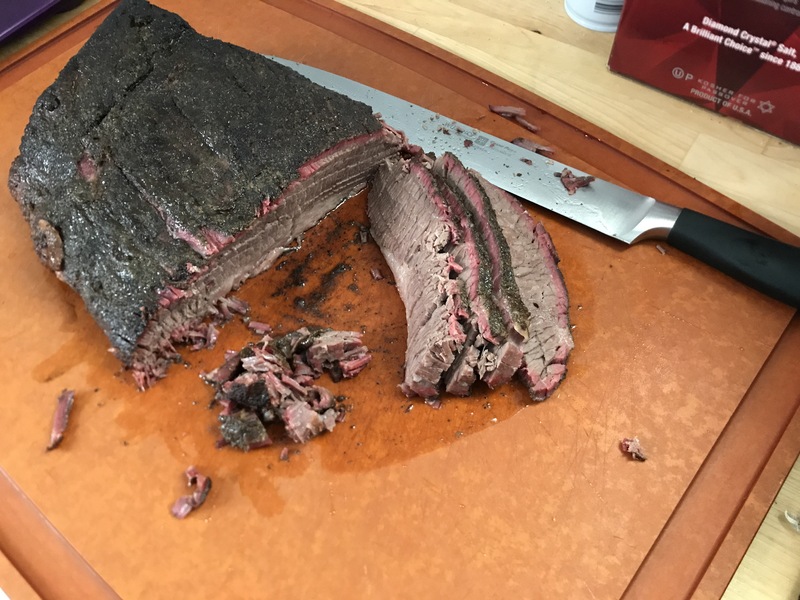 I did my first brisket ever this past weekend on a weber kettle using lump charcoal and 2 whole splits of hickory cut into chunks. One day I’m going to work up the courage to try on a Weber Kettle. I think that’s a lot harder than using what I have. Anyone has tested these Smoke Hollow Grills?